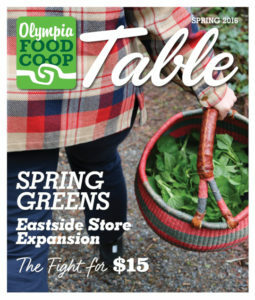 The Olympia Food Co-op, in an attempt to “support efforts to foster a socially and economically egalitarian society”, has passed a resolution to bring its starting wage for collective staff up to $15 by 2018. For the current year, 2016, that starting wage has gone up to $14 from $12.86. This decision follows the national and regional efforts of worker coalitions to demand a living wage. Long time staff member Grace Cox offers that “The Co-op already offers a solid wage and benefits package. As a Co-op employee I hope that all employers will embrace the need to raise wages for the lowest paid workers.” The Co-op has long been known for being an equitable workplace that focuses not only on local, natural and organic foods but social justice as well. The movement for a $15 minimum wage began in 2012 with New York City fast food workers walking off the job for day long strikes. Workers have argued that those who work full time should not have to work second jobs or have to rely on public assistance, which many low wage workers must do to survive. What many criticized as unfeasible and “bad the poor,” has steadily become reality as many cities have passed or are considering raises to their minimum wage. Other employment sectors such as home care workers, childcare providers and big box retail workers have also joined the movement for higher wages, as well as sick leave and union organizing rights. Locally, Sea-Tac became the first city in the United States to institute a $15 minimum wage, followed by a long term plan by Seattle. Now cities like Los Angeles, San Francisco, New York, and many others are following suit in an attempt to reduce poverty. hour. The same is true for the staff member hired in 2016 at $14 per hour, and 2018 at $15 per hour. Our pay increases will be reduced to make room for that higher starting wage, a suggestion made by our Co-op finance committee. Secondly, the total increase in our labor budget is miniscule compared to our overall budget. At $14 hour we will be spending about $20,493 more than we did in 2015 (the total budget for that year being $2,705,008 in wages). In 2018, at $15 hour, that will increase our total wages budget by another $11,034. Added to the generous benefits package that we have for our staff, we hope this will also help with retention of great Co-op workers.